In 2015, just 62 individuals had the same wealth as 3.6 billion people – the bottom half of humanity. This figure is down from 388 individuals as recently as 2010. The wealth of the richest 62 people has risen by 44% in the five years since 2010 – that’s an increase of more than half a trillion dollars ($542bn), to $1.76 trillion. Meanwhile, the wealth of the bottom half fell by just over a trillion dollars in the same period – a drop of 41%. Since the turn of the century, the poorest half of the world’s population has received just 1% of the total increase in global wealth, while half of that increase has gone to the top 1%. The average annual income of the poorest 10% of people in the world has risen by less than $3 each year in almost a quarter of a century. Their daily income has risen by less than a single cent every year. The trouble is: this is just really bad math. This sounds easier than it is. When we look around us, we can see people with houses and nice cars, and we can say “Oh yes – rich.” We can also look at people with no houses and no cars and say “Definitely poor.” But the minute you try to generalise that, you run up against problems. I mean, do you just look at assets people have? How do you value those assets? What about non-tangible assets like education and skills? What about debt? Is a person that earns the required income stream to get a R9 million mortgage to buy a R10 million house more or less wealthy than a person that owns a R2 million house outright? And this is where Oxfam gets caught. They use the “net wealth” data that gets collected by Credit Suisse (here’s the Credit Suisse 2015 wealth report). Credit Suisse’s data calculates your net wealth as “All your fixed and financial assets less all your liabilities”. Which puts us into negative wealth territory. So a student with a mountain of student debt is one of the poorest people in the world – poorer indeed than the street beggar in Africa who has nothing to his name, including no debts. None of the poorest people in the world live in China. 10% of the poorest people live in the United States. About 20% of the poorest people live in Europe. Looking at the US data: 10% of the bottom 10% of the world’s population is about 70 million people. The total US population is about 320 million people. So 22% of the US population are “the poorest people in the world”? That simply makes no sense. What about the social welfare systems that exist in the developed world? Africa’s poor certainly do not have access to that kind of safety net. The only reason that we’re looking at a statistic like “30% of the poorest people live in Europe and the United States” is because we’re dealing with regions where it’s easier to access debt far in excess of your asset base. The broader conclusion is still correct. Which doesn’t really tie up with statements like “In 2015, just 62 individuals had the same wealth as 3.6 billion people”, but perhaps that’s just me. There are strong reasons to think that the rise in wealth inequality since 2008 is mostly related to the rise in equity prices and to the size of nancial assets in the United States and some other high-wealth countries, which together have pushed up the wealth of some of the richest countries and of many of the richest people around the world. The jump in the share of the top percentile to 50% this year exceeds the increase expected on the basis of any underlying upward trend. It is consistent, however, with the fact that financial assets continue to increase in relative importance and that the rise in the USD over the past year has given wealth inequality in the United States – which is very high by international standards – more weight in the overall global picture. When these considerations apply in reverse, the wealth shares of the top 1% and 10% are likely to decline. One of the key trends underlying this huge concentration of wealth and incomes is the increasing return to capital versus labour. In almost all rich countries and in most developing countries, the share of national income going to workers has been falling. This means workers are capturing less and less of the gains from growth. In contrast, the owners of capital have seen their capital consistently grow (through interest payments, dividends, or retained profits) faster than the rate the economy has been growing. So the question: are we seeing a Pikkety-esque concentration of capital, or is this more the result of an expansion in the amount of labour available to capital-holders due to globalisation and more women in the workforce and that sort of thing? [It’s] what we would expect would happen as a result of globalisation. We bring a couple of billion more low paid and low skill labourers into the global economy and the returns to low skill labour are going to fall and those to high skill labour and capital rise. As it happens, the low skill labour that lost out here were those below median income in the already rich countries. 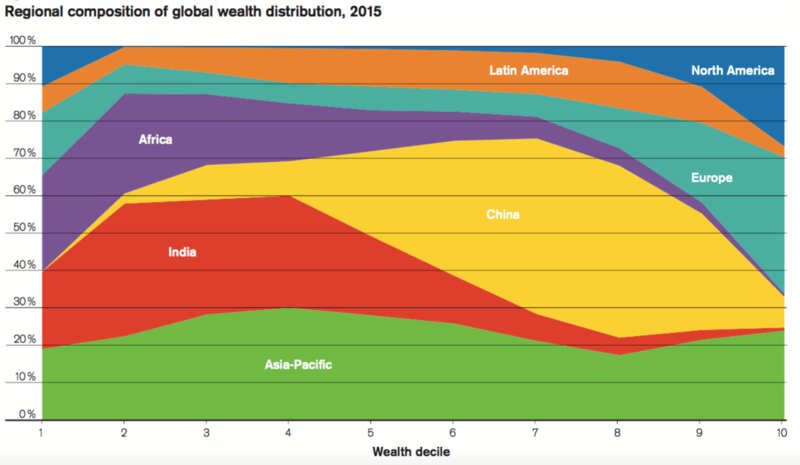 This is how come we’ve had rising in-country inequality and declining global inequality in recent decades. But that process has run its course. In fact, the World Bank (from memory, think it was them) announced just last year that we had reached peak labour. From now on the global labour force is going to be shrinking. And the above process thus goes into reverse: the capital share will fall and the labour one rise: profits do, after all, flow to the scarce resource. So really, there may not be that much to worry about? Rolling Alpha posts about finance, economics, and sometimes stuff that is only quite loosely related. Follow me on Twitter @RollingAlpha, or like my page on Facebook at www.facebook.com/rollingalpha. Or both. A very interesting perspective. This tells me that what is referred to as “labour”is like every other commodity and is valued in terms of supply and demand. What these observations uncover is that the poor are over procreating and need to cut down on the birth rate.[China]. This business of income distribution is all old hat. Just apply the Pareto principle. The Pareto principle (also known as the 80–20 rule, the law of the vital few, and the principle of factor sparsity) states that, for many events, roughly 80% of the effects come from 20% of the causes.Management consultant Joseph M. Juran suggested the principle and named it after Italian economist Vilfredo Pareto, who, while at the University of Lausanne in 1896, published his first paper “Cours d’économie politique.” Essentially, Pareto showed that approximately 80% of the land in Italy was owned by 20% of the population; Pareto developed the principle by observing that 20% of the pea pods in his garden contained 80% of the peas. It is a common rule of thumb in business; e.g., “80% of your sales come from 20% of your clients.” Mathematically, the 80–20 rule is roughly followed by a power law distribution (also known as a Pareto distribution) for a particular set of parameters, and many natural phenomena have been shown empirically to exhibit such a distribution. The Pareto principle is only tangentially related to Pareto efficiency. Pareto developed both concepts in the context of the distribution of income and wealth among the population. Again this means that 0.8% have 80%X 64%= 51.2%. This was my explanation for the 1% movement or the Occupy Movement of a few years ago. Nothing new.